Lock in a great price for Hôtel du Palais – rated 9.1 by recent guests! The location was excellent - from hotel could walk everywhere. Cocktail Bar atmosphere with singing. Restaurant food, décor and atmosphere. Room views over the bay. Gardens and pool area. Location and services were excellent. Very dog friendly and facilities were extremely clean. Exquisite property with excellent staff and service. Spa is great. Fabulous high quality high service great hotel. Food outstanding. Staff could not have been more helpful. One of our top picks in Biarritz.Previously a palace built by Empress Eugénie on Biarritz’s beach, this luxury 5-star hotel has 2 large pools and a spa and fitness center with hammam, hot tub and massage treatments. Original period furnishings and magnificent views feature in the air-conditioned rooms and suites at Hôtel Du Palais. All have a flat-screen TV with satellite channels, free Wi-Fi access and some have a separate seating area. Hôtel Du Palais serves a continental and buffet breakfast every morning. The hotel offers guests a choice of 3 onsite restaurants: L'Impératrice, which offers gastronomic cuisine from the Basque region, and Villa Eugénie, set facing the ocean, which specializes in classic refined cuisine. The Jardin de l'Océan restaurant is located by the swimming pool, has views over the city and is open during the summer season. There is a children’s playground on site. The hotel is a 2-minute walk from the casino and 10 minutes from the town center. Biarritz-Le-Phare golf course is a 10-minute drive away and Biarritz-Anglet-Bayonne Airport is 1.9 mi from the Palais. 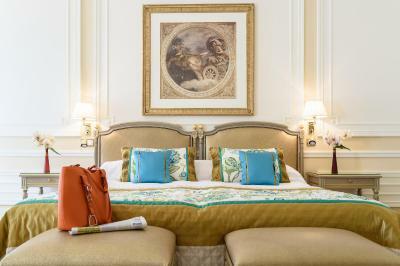 When would you like to stay at Hôtel du Palais? This classic double room offers views of Biarritz. This room has partial views over the beach and sea. 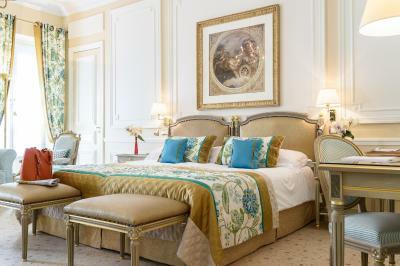 The spacious Biarritz Suite offers views over Biarritz. Upon request, guests can have a room with a separate seating area. Double Room Sea and Beach "forfait imperial"
Double Room Biarritz "Forfait Imperial"
This double room features a bathrobe, satellite TV and tile/marble floor. 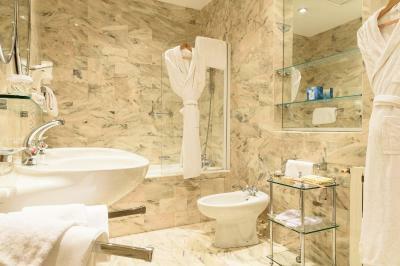 This suite has a tile/marble floor, air conditioning and bathrobe. This room can accommodate guests with reduced mobility. House Rules Hôtel du Palais takes special requests – add in the next step! Hôtel du Palais accepts these cards and reserves the right to temporarily hold an amount prior to arrival. One waiter on the terrace in the afternoon/early evening when busy was not enough. She did an excellent job but needed help to give the expected levels of service (cleaning tables when people leave)...NOT a criticism of her at all. Was surprised to be disappointed with the quality of the room service coffee when everything else we consumed was of very high quality. The staff were world class, best service ever!!! I did not like that i needed to fix the TV and they came the day after. Also they did not clean my glass who fall on the table. And i had to request napkins to clean the table myself. For a 5 star hotel it is not proper. 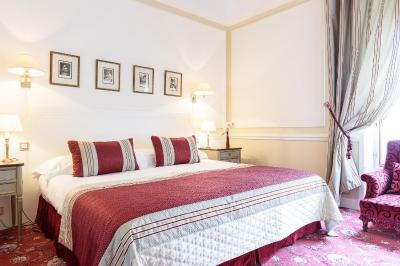 • Double Room Biarritz "Forfait Imperial"